Sometimes life comes full circle. The notion rings especially true for Asheville artist Hayden Dakota Wilson, whose father and family friends have worked as glass artists in Yancey County since the 1980s. Wilson was exposed to glass at a very young age, though chose a different path in art. But since taking up the torch in 2007, he says, he’s had the opportunity to build on his past while bringing his own vision to his work. As an undergraduate at UNC Asheville, Wilson studied sculpture and learned to cast iron and bronze. But his childhood experience growing up around glass was always present. He won an interdisciplinary craft grant for an idea he had to use the waste glaze created by the ceramics department and render it nonhazardous by using it in glassmaking. He also built a glass furnace on campus. After graduating and working for a time with friend and fellow glass artist Alex Bernstein, Wilson combined his interests in foundry work and glass, learning to fuse steel onto glass using chemical processes. This opened the door to new works such as the Stacks he makes from silvered blown and cast glass and cast iron and steel. He also innovates by creating sculptures that bear imagery. It’s a photo process of transferring an image onto powdered glass and then fusing the materials with heat; the result is an image that appears to be screen printed onto the glass. While creating experimental works is thrilling, in the career of any artist there’s a “tricky balance,” he says, between creating work that’s strictly artistic and that which is more accessible. Wilson achieves that balance by making functional glass pieces such as pint and wine glasses with simple modern elements of texture and color. Wilson also works as the manager of the Asheville Glass Center, where he and 18 other glass artists show their work and teach workshops. 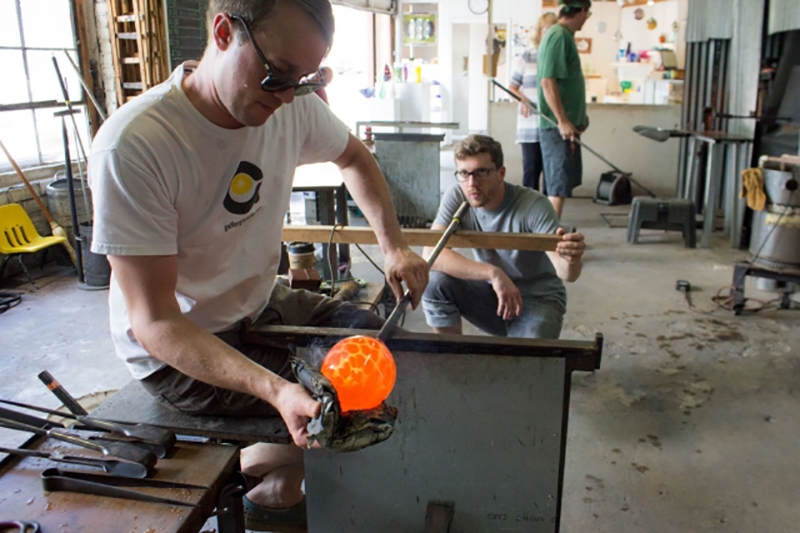 For any glass artist, having one’s own furnace is an expensive proposition, so the center’s shared resources and opportunities to collaborate are ideal. Unlike some media, glass is one in which the artist absolutely relies on help from others, says Wilson. Here, he’s able to extend the knowledge he’s received from his father and family friends out into a much wider circle. The Asheville Glass Center offers introductory workshops in glass on the weekends to ages 13 and older. Visit ashevilleglass.com. See more of Wilson’s work at www.haydendakotawilson.com.